A few months ago, we told you were were starting a new series profiling well-known Canadians who ride; we started off that series with an interview with George Stroumboulopoulos, then had a chat with Kim Coates, from Sons of Anarchy. Once upon a time there was a farm girl from Alberta who became a supermodel, then an actress, and then (most importantly) a motorcyclist. That girl is Tricia Helfer. You might have seen her in Community, Criminal Minds, The Firm, Chuck, Burn Notice, Dark Blue or Battlestar Galactica (her most famous role – she played blond cyborg Cylon 6). Or maybe you recognize her from magazine covers for ELLE, Marie Claire, and Vogue (she’s won Ford’s Supermodel of the Year contest), or maybe you’ve even seen her name in the credits for voice acting in video games from the Command and Conquer, Halo, Mass Effect, and Starcraft series. Although she’s appeared on many hit TV shows, Helfer is best known for her role on Battlestar Galactica. What you might not have known is that she has a couple of motorcycles in her garage, and she knows where the twisties are around Los Angeles. 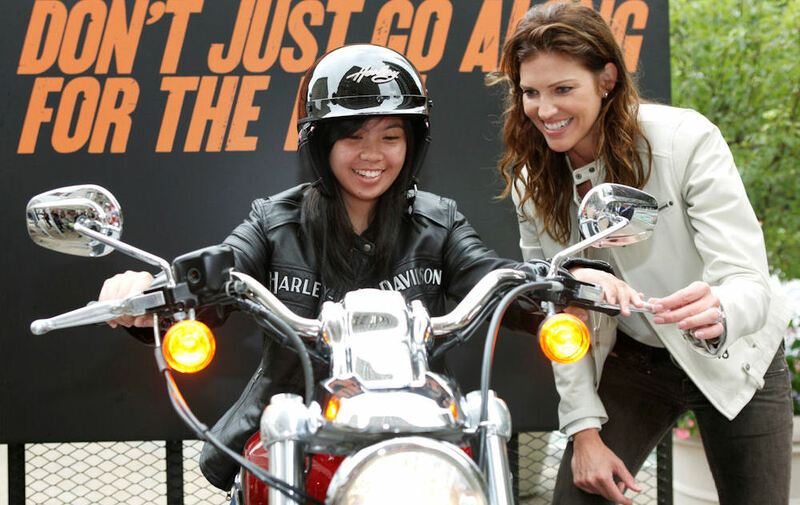 And she doesn’t just ride for kicks – she loves using motorcycles as a means of helping a wide range of charities. Helfer grew up riding ATVs on her parents’ farm in Donalda, Alberta, so it’s possible she would eventually have jumped to motorcycles. But, she didn’t get around to it until her husband started riding. At the time, she was filming Battlestar Galactica in British Columbia, so her husband had lots of spare time on his hands back in L.A.; a friend persuaded him to get his motorcycle licence, and the rest is history. “I started riding with them, just on the back, but I very, very quickly realized that I wanted to be in the driver’s seat,” Helfer says. It turned out that her friend and co-star on Battlestar Galactica, Katee Sackhoff, was feeling the same way; Sackhoff was riding around on the back of her boyfriend’s bike. Both women thought they’d like to take control of their own two-wheeled lives, so they took their safety course and got their bike licenses. But although she took the state’s training course, Helfer says nobody properly explained some motorcycling basics to her, which made riding a bit tricky at first. She could muscle around the safety foundation’s Honda Rebel, but her Harley-Davidson was a different story. “I think I got too big of a bike and too powerful a bike to start with,” she says. Her first bike was a Harley-Davidson Wide Glide; she bought it because, as a taller woman, she felt more comfortable aboard a larger motorcycle. Thankfully for Helfer, she figured out her beginner’s mistake, and moved to a lighter 1200 cc Harley-Davidson Sportster. Since then, she’s sold the Sportster (she ran out of garage space) and now rides a Harley-Davidson Rocker C with custom paint; it was a Christmas present from her husband. Obviously, Helfer is into the cruiser scene, but she digs adventure bikes as well. She’s spent a bit of seat time aboard BMWs in the last few years, and this past Christmas, she got a two-wheeled treat under the tree again, when her husband gave her a F800 GS. That’s the kind of spouse everyone should have. Helfer has even done a bit of voice acting for animation and video games; here, she appears in a cutscene from a game in the Command and Conquer series. 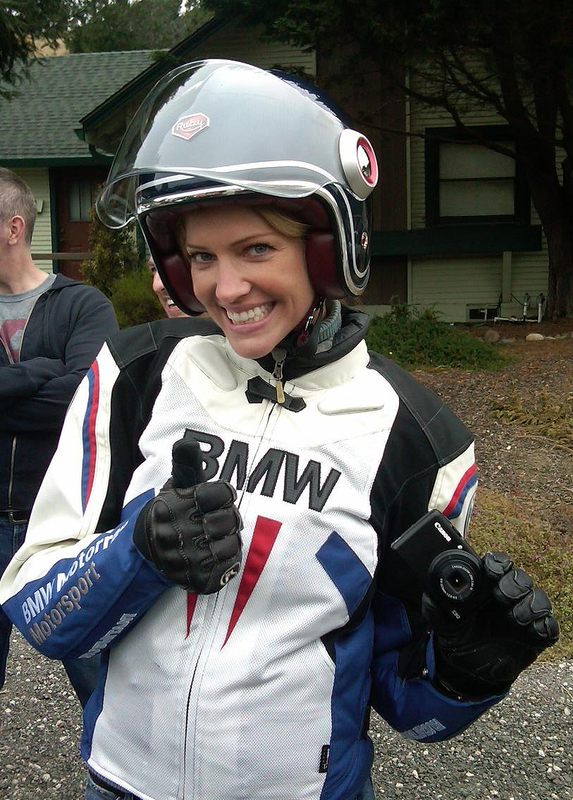 One of the biggest charity rides Helfer and Sackhoff organized was the LA “La Ride”, a fundraising effort in the fall of 2010. The two actresses rode BMWs from Los Angeles to Louisiana, retracing much of the route from the film Easy Rider to raise money and awareness for the Gulf Restoration Network, an organization dedicated to cleaning up the BP oil spill in the Gulf of Mexico. The ride wasn’t all fun and games, though – they had to battle foul weather, including heavy rain and wind at times, to make their journey, but they arrived at their destination safely, only to be faced with a much tougher task – editing the footage from the trip into a documentary. That wasn’t easy, Helfer says; she and Sackhoff were often unsure whether they should use a serious tone in the film, to remind watchers of the problems they were raising awareness for, or if they should focus on the fun side of the trip. After all, this was an exciting trip for them, and people can only handle so much bad news. You can download that film from their site here (it’ll cost you $5; proceeds go towards restoration efforts in the Gulf of Mexico – promo is here). 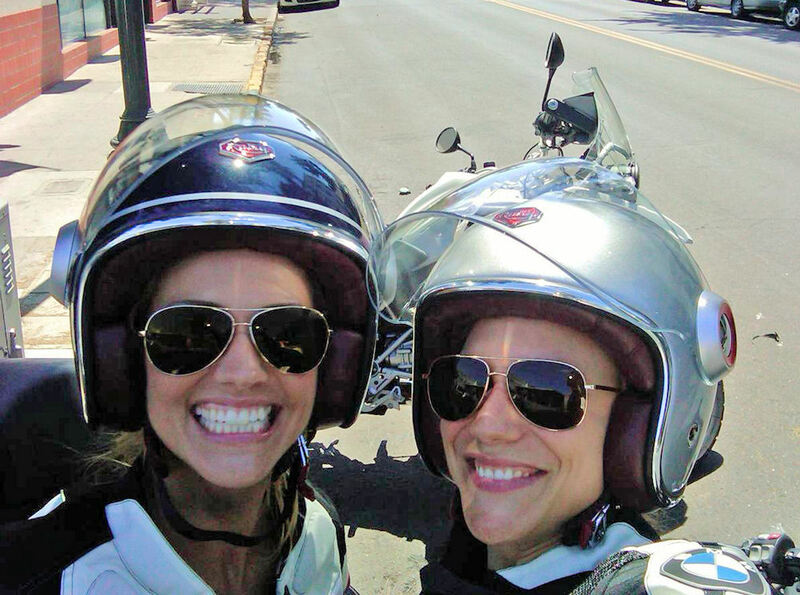 One thing is evident in the documentary – both Helfer and Sackhoff love to ride. Sometimes, they’re almost giddy with excitement over their trip. So what does Helfer like best about motorcycling? “I find it a stress reliever. You have to be so aware of everything around you that it’s a weird mix of being able to daydream and be in your own world, but yet you’re also hyper aware of what’s going on around you. You’re so focused on it that you can’t be thinking of your stresses and the things of your daily life, if that makes sense,” she says. Of course, she says she enjoys the speed as well, she says, although she’s not a risk taker. She doesn’t wear all the gear, all the time, but she never rides without her helmet and jacket (unless she’s posing for photos). “I dumped once on sand, on a right-hand turn, and if I hadn’t had a jacket on, I would have had a broken elbow, and if I didn’t have a full-face helmet on, I would have had a broken chin, and that’s just going 15 miles an hour around a corner,” she says. And broken bones aside, road rash isn’t exactly a good thing when you’re in her line of work either. Helfer’s lucky to live in her adopted home in the canyons outside Los Angeles. She doesn’t have to go far to find great motorcycle roads – she’s surrounded by great roads, like the Mulholland Highway, Little Tujunga Canyon Road and the Angeles Crest Highway. Through her charity work, she’s also had the chance to ride through much of the U.S. but there are a few trips she’s still hoping to get the chance for. She’d like to ride across the northern U.S. someday, and is also hoping for a chance to cross Canada on two wheels. But if she was heading out the door and riding off into the sunset today, she’d continue a route she’s already ridden, up the California coast, to Big Sur and beyond. Helfer isn’t as self-sufficient as she’d like to be on the open road. “Having grown up on a farm, and having worked on a farm and fixed farm machinery and things like that, you’d think I’d be better, but I think the many years in between being a kid on the farm and now, I’ve completely forgotten everything,” she says. She loves group ride for their combination of group experience mixed with a rider’s individual experience, but it’s also a great way for her to stay in touch with her riding buddies. Local police don’t need to worry about them starting up a one-percenter gang, though. Helfer says she can’t even think of a good name for an outlaw motorcycle club – the Hells Angels have the corner on that. She isn’t big on anti-social streetfighter-style riding either – after having several discs replaced in her back, she isn’t going to start practicing wheelies. So, unlike Steve McQueen, she isn’t likely to spend her downtime doing motorcycle stunts. Helfer appeared on NBC’s Community this winter. 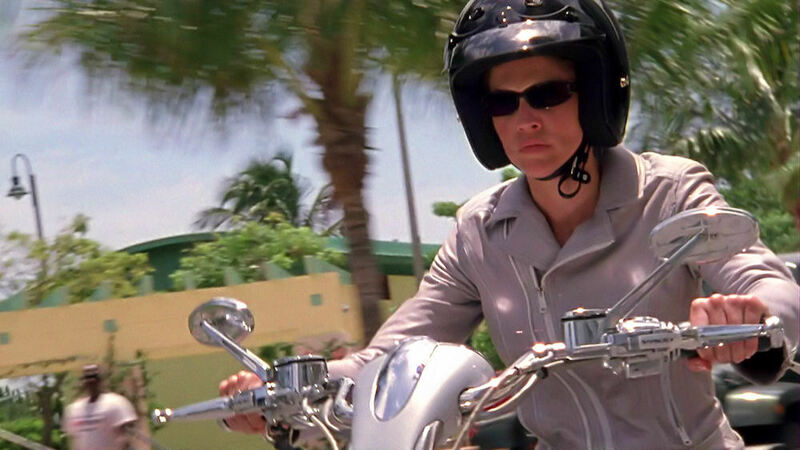 She did manage to get a scene riding a V-Rod when she was on Burn Notice, though she found it difficult to make it look like a high-speed chase when she was actually had to stay in first gear for the cameraman’s safety. Helfer managed to sneak some motorcycle riding scenes in to her Burn Notice role; she’d like to make an appearance on Sons of Anarchy. Her dream motorcycle job would be another riding role on TV again. She shot a pilot for TNT last year for a show called Scent of the Missing about a canine search and rescue team; she’d tried to talk the producers and writers into letting her ride on the show, but ultimately, it was a moot point as the show was never picked up. She’s just signed on to another pilot for a ABC drama titled “Killer Women,” where she’ll play a Texas Ranger, so maybe she’ll get another chance to ride on the screen there. Aside from that, Helfer says she’d love to get an arc on Sons of Anarchy, or maybe even a Long Way Down-inspired adventure ride for a network, wheeling across Canada with Katee Sackhoff and George Stroumboulopoulos – she’s a huge fan of the TV motorcycling series by Ewan McGregor and Charley Boorman. But it’s not as if she needs any more riding work on her plate at the moment; between riding for fun and riding for charity, Helfer’s got plenty of two-wheeled action going on already. Tricia Helfer in Burn Notice, Season 2. Helfer in Season 2 of Chuck. Chances are, if you recognize Helfer, its from Battlestar Galactica. Helfer, in her most famous role as Cylon 6.
about her riding, riding choices, or riding lifestyle. She is kind of cute, but far too skinny and altar-boy-like for my tastes. Pretty sure Pamela Anderson had some film where she played a biker. Disappointed that Tricia had to go from Burn Notice but it was worth it to finally see Carla meet her maker. LOL. Tricia sounds like a good ambassador of riding in general. She has the description of alertness and relaxation right on and understands her pros and cons with her decisions on gear and choice of bikes. She makes very intelligent choices with motorcycles and gear. It’s great to see a celebrity who’s riding for more than just the image.